I love cooking comforting food this time of the year. I know everyone has a different opinion of what comfort food is, but for me it is a large pot of soup with Colombian flavors simmering on the stove . I usually make my bean soup with dried beans, but this week I was craving this pinto bean soup that my grandmother used to make. However, I forgot to soak the beans overnight, so I decided to make a quick soup with canned beans instead and I must say, this a great alternative when you don’t have time to simmer dried beans for 3 hours. n a large pot over medium heat, cook the chorizo until browned,about 5 minutes. Add the stock and corn.Bring to a boil. Reduce the heat to medium and cook for 15 minutes, add the beans, carrots, hogao, cumin, potatoes, plantain and yuca. educe the heat to medium-low and cook for about 35 minutes minutes more, Add more stock if the soup is too thick. Season with salt and pepper. dd fresh cilantro and serve with white rice and avocado on the side. Mmm! This looks so perfect for a blustery winter day! Delicious! Anything with chorizo! 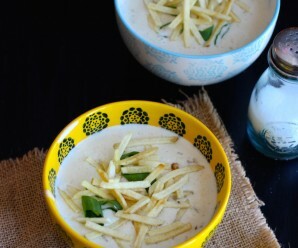 I always crave for soups during winter…so heartwarming! Oh my. oh my would love to try this. Only its difficult to find hogao and yuca here. Is there anything I could replace them with? Ruth- You can omit the yuca. I could go for a bowl right now, it’s freezing in Massachusetts! That looks perfect! A lovely soup for this frigid weather we are having here in NYC. Looks quite comforting and substantial. What a yummy soup, it looks so healthy and full of flavor! I love how you serve the rice alongside, it makes a really beautiful presentation! This soup looks great! 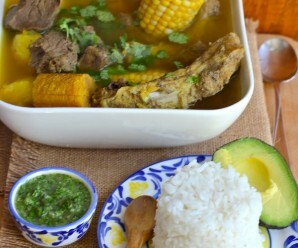 I’ve never put yuca or plaintains in soup, I’ll have to try it one day. This soup sounds perfect right now… Warm and comforting! This soup looks like it is full of all kinds of goodies and it’s so pretty! Oh this looks wonderful. I hope to try it soon. I have to figure out where to buy the yuca. Thanks for sharing!!! Looks delicious! And perfect for the cold weather we’re having. Delicious! I love chorizo, such smoky goodness. 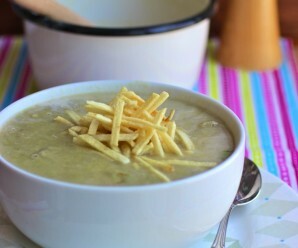 This soup really fits the bill right now with the dreadfully cold weather we’re experiencing. I love your blog–the tres leches cake sounds incredible. I have to figure out how to follow it. This soup sounds super delicious with chorizo! I love the looks of this soup, tasty delicious and filling. You might convert me to a 100% soup diet except you keep coming up with some other crazy delicious recipes too! Wow… What a great look soup, love all the Ingredients. I don’t care if this was “the quick version”, it looks spectacular!!!! I’m going to have to try this one soon. Canned beans are so handy when you need a quick dish. Love the chorizo in this–lots of wonderful flavor! Alex- Drain the beans and discard the water. 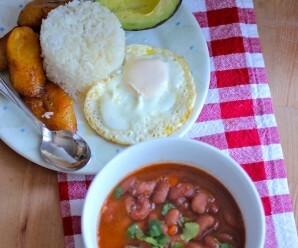 Does anyone know where in San Francisco Bay Area I can get the Colombian chorizo?